I learned to Fly Fish! When I was a kid, I used to think that fly fishing involved waving the fly around in the air until the fish jumped out of the water to eat it. I was wrong. A couple weekends ago, I finally got to try it for real. And look, I caught a monster! My wife Valerie and I ventured in to the High Sierra in search of California’s Golden Trout. I had seen pictures of these amazingly unique fish and read that they mostly live in alpine lakes above 10,000 feet, so that is where we’d go. Though southern California may seem to think otherwise, May is still snow season in the High Sierra. After hiking through the snow in the night and missing a log crossing to the first lake, Valerie and I quickly pitched the tent in the driest spot we could find. Following a chilly night, we made our way to the first lake on the trail, Lower Pine Lake, and set out to try our hand at this fly fishing thing. With rod and reel in had, I first had to choose the fly and line for the fish. The fish up here are not going to be too large, so a smallish fly with some thin 7x tippet is what I tied on to my 5x tapered leader. I had kept my eye open for the bugs that might be hatching right now and picked one that closest matched from my fly box. No hits from this lake, so we pressed on up to our camp for the night at Honeymoon lake. We could see the clouds rolling in and knew this meant more snow. We were able to throw a few casts before the snow came down and had much better luck! Val reeling in another tiny brook trout on the Redington Vapen rod. We were getting a few hits and caught a few little fish, no golden trouts just yet, but I was still hopeful that we could find them. I had a guide of the lakes up here that said this lake should have goldens, but the lake only 1/4 mile above us, the aptly named Golden Lake, should be loaded with them. We’d try for that tomorrow. Not the Golden Trout we came in search of, this little Brook Trout is still beautiful (magnify and check out the detail of his patterns). Vapen Rod and Rise Reel by Redington. Losing flies was a common occurrence for the day as my back cast continued to fall prey to the bushes behind. The Savage Creek Chest Pack from FishPond USA had plenty of little compartments for all the extra leaders, tippets, flys, and tools you could need. You can use a typical set of nail clippers to cut your line/leader/tippet, but a purpose built set of clippers, like this Barracuda attached to a Retractor will make your life much easier. As the sleet/snow continued to come down through the evening I donned my rain gear from Wild Things Gear that I had been waiting to use and continued to fish through the evening. For a hard shell system, it was surprisingly flexible and kept me completely dry. Val retreated to the tent and watched while I cooked her dinner. The Big Agnes Copper Spur UL 2 is rated as a 3 season tent, but held up to a little snowfall just fine. The roof did sag a little with the weight of the snow, but once again, this tent has proved why it is my favorite. Honeymoon Lake had partially frozen on us over night. The knee-deep snow kept us from reaching the trail-less Golden Lake so we instead followed the trail over towards Pine Creek Pass, in hopes of making it in to the French Canyon and a few other trout-rich lakes. None of us like carrying bulky, heavy bear canisters, so Wes bought the team one of the new Ursacks. You supposedly don’t have to hang it like a bear bag as its tooth and claw-proof, but a little good practice learned in the Boy Scouts never hurts. We didn’t see any bears this weekend. This plan was again foiled by the snow. The pass was within sight, but the trail was long gone and we had not brought gear for trekking through snow. The clouds started rolling in again, and with nowhere left to explore, a lack of desire for another snowy night, and a hunger for the golden trout, we went back home. This adventure was absolutely a unique one, Valerie still loves me, and the snowy mountains were continually breathtaking, but we’ll wait for the snow to melt before coming back so we can explore more of the lakes. 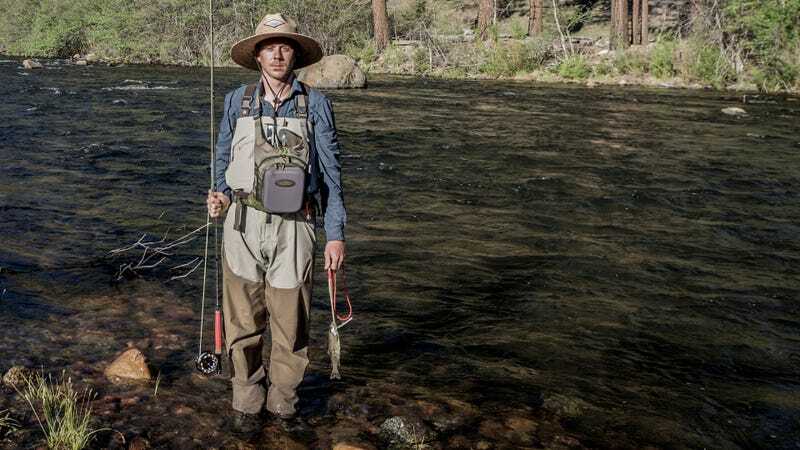 After that snowy weekend, I was still hungry for some wild trout, so the following weekend, my friend Jake and I set out for the Kern River, more wilderness, and more wild fish. Though we were entering the Golden Trout Wilderness, the area of the Kern we were headed is not populated with goldens. Jake and I waded up and down the river, he in his jeans and flip flops, while I was smart and brought a pair of waders and boots. He nearly froze his lower half off, and I stayed dry, until I tripped and flooded my waders. That was terrifying. You will hear stories of guys flooding their waders and drowning, but since the river wasn’t too deep I was able to stand back up and was now annoyingly just as cold and wet as Jake. Up until this point, the Redington Sonic Dry Fly waders worked perfectly. They were trim fitting and not loose or baggy, the booties fit my feet as they were supposed to and they were very comfortable. There was no extra material to bunch up anywhere, and the shoulder straps were extremely comfortable. Prior to this first flooding, I had not tightened the waist belt tight enough, and water just went right past it. After that, I learned my lesson and cinched that thing tight around my waist, which was good, because I tripped and flooded them again right after having dried off. This time the water did not flow, but was contained in the top half, so I simply bent over and let the water drain out. It was kind of refreshing, but again a little annoying. The chest zip pocket stayed dry and so did my fishing license which was tucked inside. Match the bug to the fly and the fly to the fish. If you were to ask Jake to tell this story, he would probably highlight the fact that I let his monster Rainbow trout go, and I did, it was slippery, broke the line and swam off. Sorry Jake. We learned our lesson from that and will use a net from here on out. Improvising, we used the mesh bag that my waders came in and didn’t lose another fish after that. I landed a small little guy (top picture) and was super stoked to have caught the first fish of the trip. With the sun setting, our dinner table still a little scant, so we kept on casting. I had waded out to the middle of the river, which was awesome for doing nice long casts. You are guaranteed that your back cast is not going to catch a bush if you’re in the middle of the river and casting to the far bank. I had seen a fish surfacing over in a small slow spot behind a rock and tried carefully to drop my fly as lightly as possible where I had seen him. As soon as I did, he took it and ran. I yanked on the line to set the hook and he was mine. Jake kindly helped secure him in to the mesh bag and we had a healthy size German brown trout for dinner. My first trout worth cooking! Since I caught all the fish for the day, I made Jake cook them for me. It was only fair. I helped him clean them, then we prepped them for the fire; red onions, yams, and a little seasoning. You have to put in the leg work and hike the extra distance to get those one-of-a-kind campsites complete with tables and chairs, perched on a beautiful meadow surrounded by a flowing river. We did just that and were rewarded with this prime spot right on the river, without a soul for miles. While the fish were cooking, we took this opportunity to reflect on the day, relive our fishing stories, and enjoy a delicious IBC root beer. I know what you are thinking, and yes, Jake carried a 4 pack of glass bottles in to the backcountry (don’t worry we packed all our trash out). With bellies full of fish, we retired for the night, and let the moon and stars put on quite a show for us, welcome to the moonrise kingdom (watch in HD and full screen)! With a wide beam, a focused beam, and a light sensor, the rechargable $100 Petzl Tikka RXP chooses the brightness for you based on the ambient light, full review coming soon. Rise Reel ($170) and Vapen Rod ($300). We found the Echo rod to be softer and easier to cast further, but the fine action on the aluminum reel of the Redington made it tough to put down. You can’t go wrong with either setup here. Given our level of experience, a slower flex from the Redington rod would have been a better choice. Golden trout, we’re still coming for you. IndefinitelyWild is a new publication about adventure travel in the outdoors, the vehicles and gear that get us there, and the people we meet along the way. Follow us on Facebook, Twitter, and Instagram.